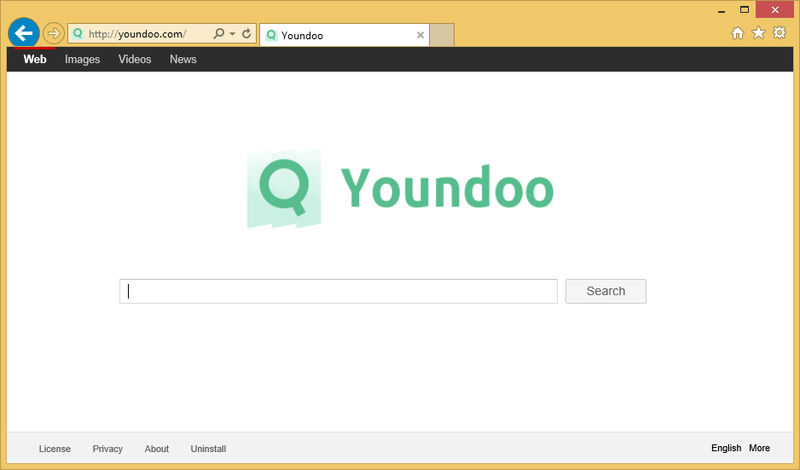 Youndoo Virus is a browser hijacker that can alter your browser’s settings. It can infiltrate your computer if you install freeware and not notice that Youndoo Virus is attached to it. Even though it can enter your computer without your knowledge, it’s not a malicious computer virus. It will not endanger your computer directly but it will make unwanted changes to your browser. It might also expose you to various intrusive ads. Some browser hijacker have the capabilities of exposing users to dangerous websites where they can accidentally download malware onto their computer. Even though it’s unlikely that Youndoo Virus can do that, you should not risk it. Youndoo Virus doesn’t really have beneficial features that would make using it worth it, so we suggest you remove Youndoo Virus. Especially since it installed without your knowledge. Why should you uninstall Youndoo Virus? You might not realize it, but you installed Youndoo Virus yourself. A browser hijacker needs permission to enter your computer. It’s attached to freeware so that when you install the freeware, you end up installing Youndoo Virus browser hijacker as well. This happens if users use Default settings and rush through the installation process. If you choose Advanced (Custom) settings, you will be able to deselect all added items so you will not have a problem with unwanted installations. We suggest you take our advise because having to delete Youndoo Virus takes much more time than just deselecting it. Once Youndoo Virus is on your computer, it might set itself as your homepage and new tabs. It seems to be able to affect all major browsers, including Internet Explorer, Google Chrome and Mozilla Firefox. Usually browser hijackers prevent users from changing the settings back. So the only way to get rid of the new homepage would be to uninstall Youndoo Virus from your computer. The website itself has a search bar that generates results via Yahoo and Google, so there’s not much use in using it since you can just go to Yahoo or Google. It also has nice backgrounds that would most likely tempt some users into keeping Youndoo Virus on their computers. Youndoo Virus might also be able to generate intrusive ads or pop-ups that would not leave you alone until you remove Youndoo Virus. Youndoo Virus can also collect your personal information, if you provide it yourself. It does not seem like a reliable website so we suggest you terminate Youndoo Virus from your computer. Using a professional removal tool to delete Youndoo Virus would be the quickest option. However, if you do not have such a program, you can also erase Youndoo Virus by hand. It might take a bit more time because you will need to locate and eliminate Youndoo Virus yourself. To help with Youndoo Virus removal, a guide will be added below.